The legend of Saint Patrick has evolved during the 1500-odd years since the missionary brought Christianity to Ireland. Much embellished in the telling, his story has become a mixture of truth, myth and allegory. 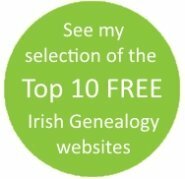 There's an overview of the saint's life on the History of St Patrick page, but read on below for some of the myths about his mission in Ireland. Attributed to St Patrick, the poem known as The Deer's Cry or St Patrick's Breastplate tells the story is told of how the saint used a power called féth fíada to transform himself and his companion into wild deer so that they could escape ambush while on their way to preach at the Hill of Tara. This royal hill in the Boyne Valley was the ancient capital of Ireland and, to the Druids, the sacred dwelling place of their gods. Awaiting their arrival, and with every intention of attacking or imprisoning the two Christians, their Celtic adversaries saw only a deer with a fawn roaming across the fields. As a result of this power, the missionairies successfully reached the Hill without incident. The Celtic feast of Beltaine (Feast of the Fires) was a major festival to celebrate the beginning of summer and triumph over the dark powers. Traditionally, a fire would be lit by Ireland's High King on the top of the Hill of Tara, and his fire would then be used to light all other fires. So, when St Patrick lit a fire in advance of High King Laoghaire, he was deliberately inviting attention from the pagan chiefs. The druid elders were sent by Laoghaire to investigate and they reported back that Patrick's fire had magical powers because they could not put it out. They warned that if the King did not extinguish Patrick's fire, it would burn forever. King Laoghaire was unable to extinguish the saint's fire and accepted that Patrick's 'magic' was stronger than his. Although he did not choose to convert to Christianity himself, the King endorsed Patrick's mission to convert the Irish. This legend of Saint Patrick is set on a day when the missionary was preaching close to a pagan standing stone. The latter would have been considered sacred to some of his audience of potential converts because it was already carved with a circle. This mark would have been familiar to all pagans as a symbol of the sun or moon gods. St Patrick is credited with drawing a Christian (or Latin) cross through the circle, and blessing the stone. 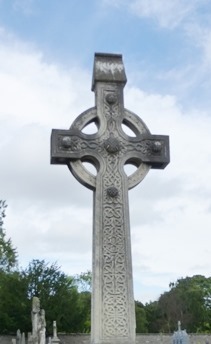 In this way, it is said, he created the first Irish Celtic Cross and showed himself willing to adapt heathen practices and symbols to Christian beliefs in order to ease the transition from pagan to Christian. St Patrick spent the forty days of Lent (the Christian period of fasting or self-denial prior to Easter) on a mountain in County Mayo. The mountain is now known as Croagh Patrick. During these days, he was harassed by demons disguised as blackbirds. The birds formed such dense clusters that turned the sky black. But according to this legend, Saint Patrick continued to pray and rang his bell as a proclamation of his faith. In answer to his prayers, an angel appeared and told him that all his petitions on behalf of the Irish people would be granted and they would retain their Christian faith until Judgement Day. Probably as famous as the story of the shamrock is the legend of Saint Patrick driving all the snakes of Ireland into the sea where they drowned. 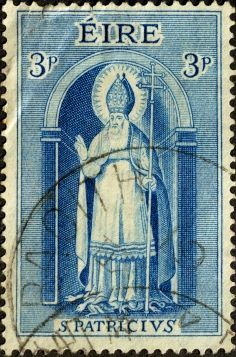 In the postage stamp at the top of the page, and in many images of the saint, Patrick is seen standing on snakes, ie conquering snakes. The well-received message is that there are no snakes in Ireland (save those in zoos) and he alone is responsible for this happy state. It is, however, very unlikely there were ever any snakes in Ireland! This particular legend of Saint Patrick is easy to translate: snakes were sacred to the Druids; their banishment reflects St Patrick's success at removing pagan influence from the island. A brief history of St Patrick. How did St Patrick's Day become a worldwide celebration?